Lightweight and portable. So this new charger is the size and shape of a credit card, designed especially to transport it comfortably, so its developers have designed with this particular form so that we can carry in our purses or pockets. 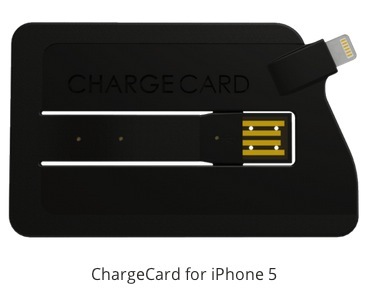 Just as many other accessories that we present, ChargeCard began as a project that bet on Kickstarter. And this time the developers have not only managed to make it happen, but also are having an absolute success. While some colors are sold out. It is compatible with any iPhone or iPad model, and even offers a version for micro USB phones and other devices. The charger has two inputs: one for charging the device (Lightning in the case of the iPhone 5 available in mid-May) and a USB port to plug into. So we loaded our phone on any device with this entry. Easy and convenient, is not it? Each of the chargers cost about $ 25 (about 19 ​​€). If you're interested, you can buy them at the following link .